Happy Friday! Not only am I glad that weekend has arrived, but I'm really excited to share this post, and for several of reasons. The first being this dress. Between the high neck and cold shoulder cut, I can easily say that I'm in love. Not to mention the color is gorgeous (and this is coming from someone who normally doesn't wear color). This ribbed, high neck beauty is by Splendid, and I picked it up at one of my new favorite stores, Shake The Tree Boston, which happens to be the second thing I'm excited to share. Shake the Tree is a boutique located in Boston's North End. Amongst the streets lined with the most delicious food, mostly including pasta and pastries, you'll find this cute little shop filled with, well, pretty much everything you would want to add to your home. Not only does the Shake The Tree carry an amazing selection of clothing, but you'll also find the most beautiful handmade jewelry, small brand apothecary, contemporary home goods, barware, cookbooks, and candles to last you a lifetime. Not only will I be back to restock my wardrobe, but it's pretty safe to say that I'll be doing most of my holiday shopping there. And finally, I'm excited to share these photos. They were taken by a local photographer, Kate Salerno, and I couldn't be happier with the way they turned out. Although I've only worked with a couple of photographers in the past (my husband is usually the one behind the lens), I felt so comfortable with Katie, which made it such a fun experience. If you live in the Boston area and are looking for a photographer, I highly recommend Katie Salerno Photography. Stay tuned for Monday's post as I'll be sharing another look from Shake The Tree. I hope everyone has a wonderful weekend. 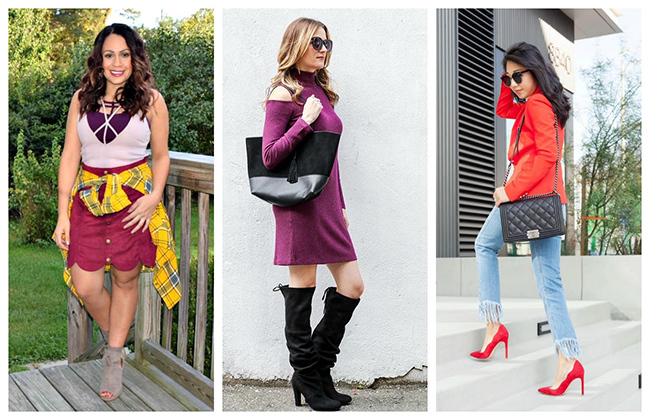 Dress, Bag, and Earrings: via Shake The Tree| Boots: Steve Madden (similar here)| Sunnies: BP (similar splurge here, and steal here and here)| Bracelet: Vita Fede. The feature blogger of the week is Jules of Jules in Flats. I'm loving how she pulls off the red pant! Make sure to visit her blog and say hello. Great look! The dress is a gorgeous color indeed, and I love the cold shoulder detail. You look fabulous! This is such a pretty look! Love the color of your dress and those boots are fabulous! This dress is stunning on you, you look great Rachael. What a great dress! Love that color with your black OTK boots. And how fun to work with the photographer. Great photos. This dress fits you like a glove! Don't forget to check out this outfit I am wearing this week at the blog for the last installment of my exciting collab with fashion forward brand STAYING SUMMER - I am sure you'll like it! This dress looks amazing on you Rachael! The cold shoulder and color are amazing! This outfit is gorgeous!!! Love the boots! Cute! I loved how you used the same shades with the dress and your purse! How fun to get pics by a real photographer! I mean your pics are great normally but it's just fun to do something new! Obsessed with the color coordination of this outfit! That bag matches perfectly! This dress is SO darn perfect! 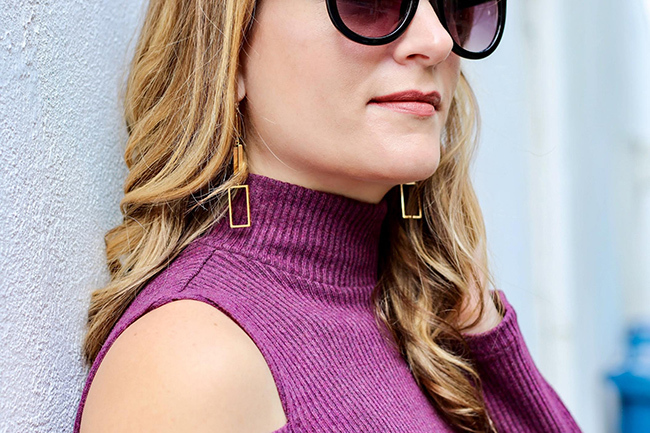 I just love the cold shoulder/turtle neck combo and the color is great for fall, too! Such a stunning look, babe!! I'm in love with those boots! Very cute, and such a great color!